Hey September Second, you’re lookin’ good today! Today, I’m going to share with you one of my favorite recipes in the history of recipes. These Chicken Street Tacos came together by accident and my goodness, It’s probably one of the happiest accidents that I’ve had in the kitchen to date. It’s time for Fall. It’s 62 degrees outside right now. The windows are open. Pepper is wearing the cutest little button down jean shirt and leggings. And here I am, in my pajamas still. Mom-life at its best. Pepper will forever be better dressed than me, but I’m okay with that. I clean up alright when I get the chance. Eric even told me I was just as beautiful as the combine we saw on the road this past weekend… Okay, he said more beautiful. But, I’m being compared to a big, green combine .. so, whats the difference? I’ve been dutifully in the kitchen whipping up some comfort classics like chicken and rice, stove top fried apples, skillet chili cheese mac, shepherds pie…. oh, I’m itching to share all of these with you, and I will! It’s funny because I literally want to post a recipe every single day of my life. I want to get it ALL out there. I want to share EVERYTHING. RIGHT NOW! I’m not a patient woman. Nope, not even a little. I’m always trying to make every recipe better than the last. I’m constantly trying to re-invent the wheel here, but I have to keep in mind… This isn’t a race. This isn’t a competition. This is a happy place for me to share my random thoughts and my recipes, and I hope to be doing this for YEARS to come. Maybe it’s the beautiful weather that has made me come to this realization, or maybe it’s just life has been so busy lately that I just want to sit back and relax a little bit more and enjoy my sweet family. Either way, I’m going to continue bringing y’all some delicious meals and if the photographs aren’t perfect, well, That’s life! Pretty photographs don’t make the food taste better and that’s a fact, Jack! Now with all that said here’s a little chicken street taco talk for you. 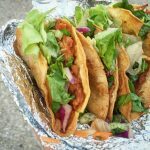 What’s the different between street tacos and tacos? I don’t know. I have no idea. Please don’t ask me again. 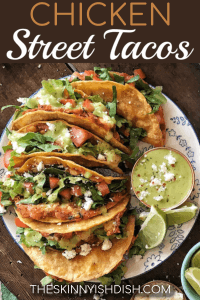 Street Tacos came from the early days in Mexico where farmers would need something quick, delicious, filling, and not messy! So basically, it’s the mexican version of the ham and cheese sandwiches I send with Eric in his lunches. Food Trucks are ALL the rage these days. Sadly, we don’t have them in the middle of nowhere, Illinois. BUT I have had tacos off of a truck and they were delicious. And I want them again. Please mail them to me! Here’s my take on Chicken Street Tacos. They may not be super authentic, but I do what I want in my kitchen. This recipe makes a MESS of tacos. I don’t mean mess as in they are messy, I mean mess, as in they make like 500 tacos (not really, but close). 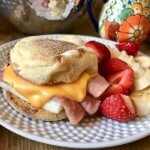 They are quick, delicious, filling, mess-free, not a ham and cheese sandwich, and they also reheat great! 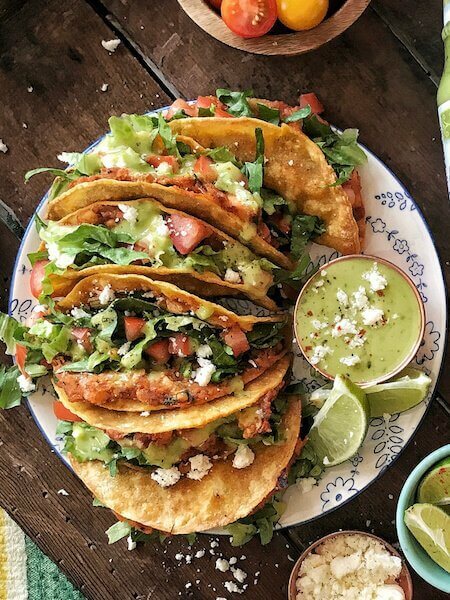 One more thing, if you’re living that Weight Watchers life like I am, these babies are just 2 Smart Points each… which means you can have all the tacos on Taco Tuesday! 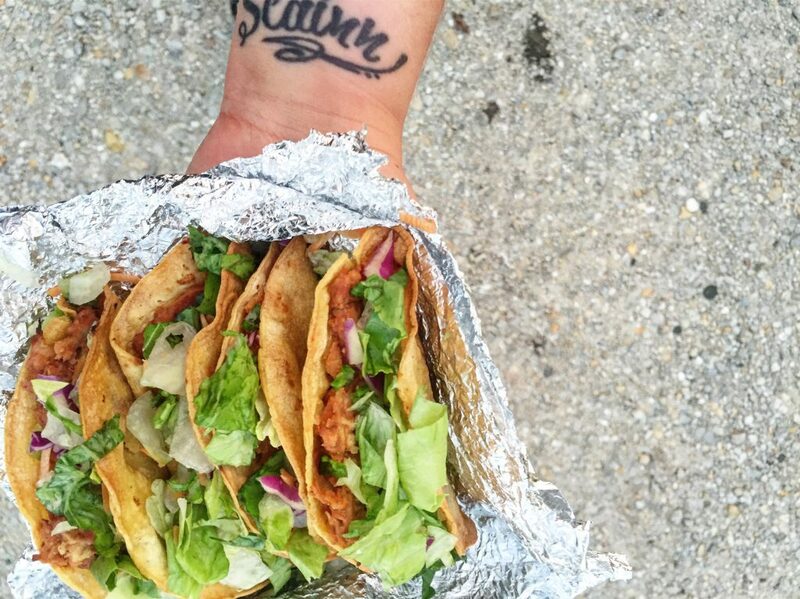 Grab the usual suspects for tacos! 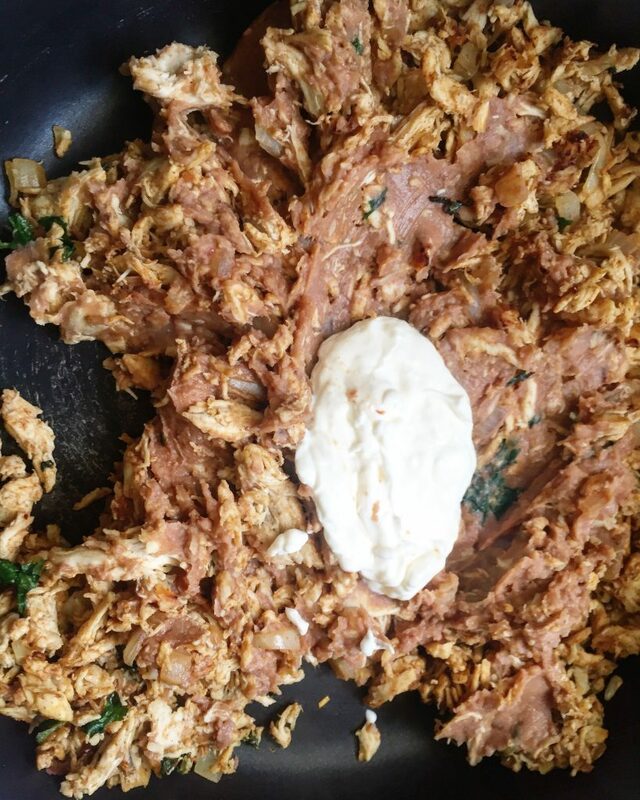 cheddar, sour cream, taco seasoning, fresh cilantro, refried beans, corn tortillas, and shredded chicken! 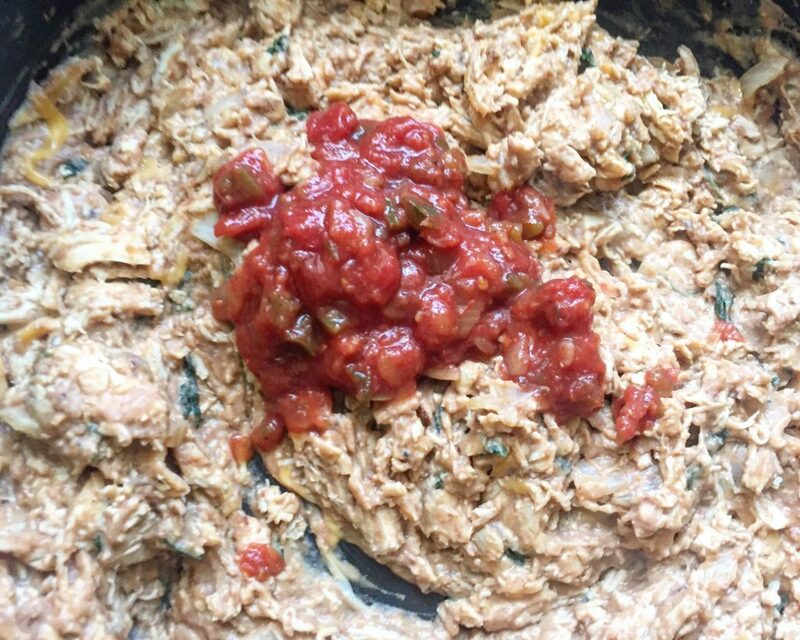 (Here’s my easy peasy crockpot shredded chicken recipe). Also, some salsa. I forgot that in the photo. Here are the exact tortillas I used for this recipe. 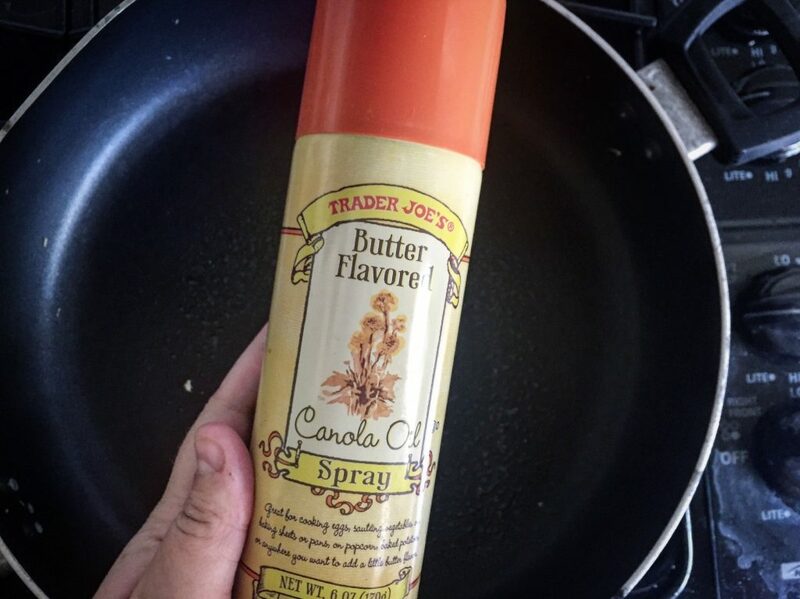 Grab a large skillet and lightly spray with a bit of cooking spray. Any kind will do. Stir it up and cook over medium-high heat until the onions are bit soft. Mix in the refried beans. Add the greek yogurt, cheese, and salsa. Stir until combined well. Then set aside. Next up, grab another skillet, lightly spray with cooking spray, and then plop a tortilla on it. Lightly spray the top of tortillas with cooking spray and flip after about 30 seconds. These only need to be lightly “fried” because they will get a nice crunch when we pop them in the oven later on. Repeat this until you’re out of tortillas. 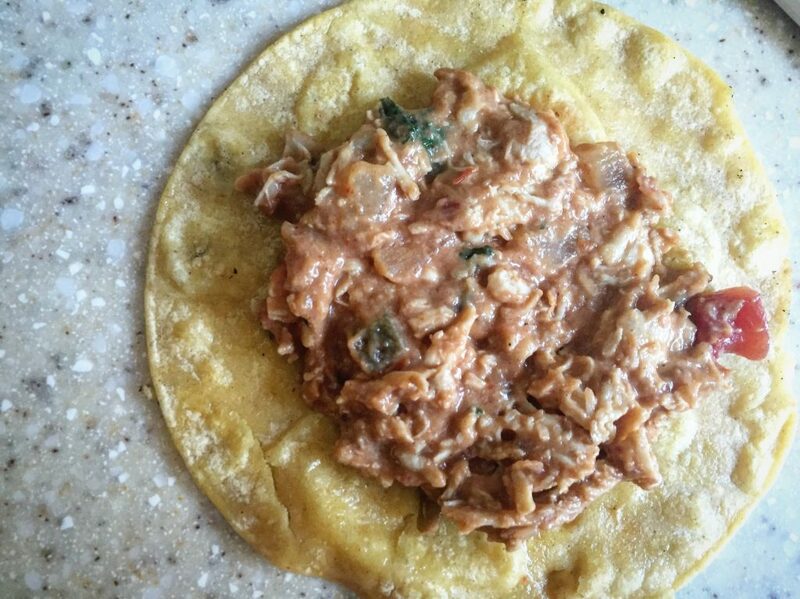 Every four-five tortillas I would stop “frying” and fill the tortillas up with the chicken and bean mixture. You can do it after every one that you fry, or cook a few and then fill. It’s up to you. Once they’re folded up- line them on a cookie sheet and pop into a 425 degree oven for about 5-8 minutes (until golden brown and they are hard to touch). How to store & reheat: Wrap tacos in foil to prevent them sogging up, yep “sogging up” is a technical term. I wrapped three at a time. When I went to reheat, I took them out of the foil and laid flat on a cookie sheet in a 400 degree oven for about 10-12 minutes. You could easily halve this recipe, but I really like having lots of tacos to eat throughout the week. These would also make great appetizers for those upcoming football parties! I topped mine off with a chopped mixture of romaine, purple cabbage, and carrots. Otherwise known as, a bag of pre-chopped salad mix from the store. It tasted perfect! These would also be delicious with a mix of lettuce, cilantro, tomato, and fresh onion. In the spirit of them being street tacos, I took them out and ate them while walking around on the street. I felt like it was my duty to test the theory. 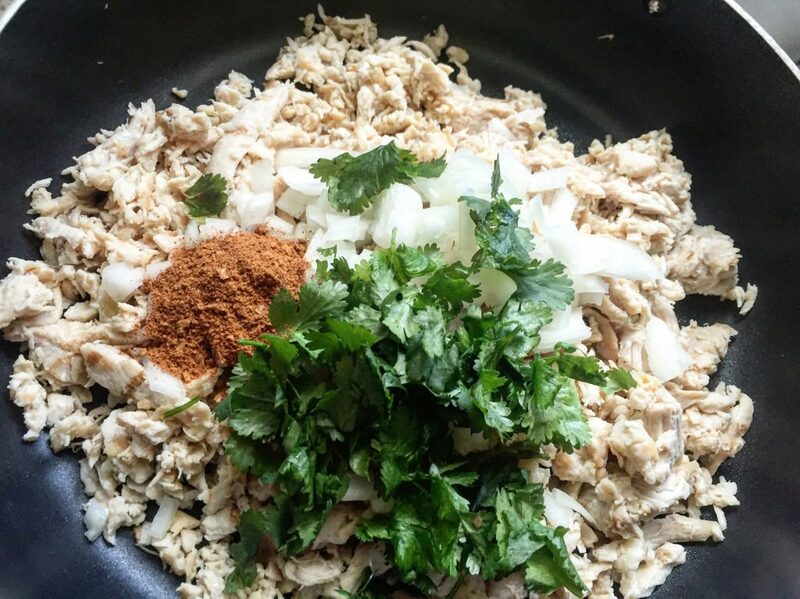 In a large pan heat the chicken, onion, taco seasoning, and cilantro together over medium-high heat until the onions are tender. Add the refried beans, mix thoroughly and then add the greek yogurt, cheese, and salsa. Mix together and cook for a few more minutes. Set aside. In another pan lightly spray with cooking spray and place tortilla cook for about 30 seconds, lightly spray top side of tortilla, flip, and cook for another 30 seconds. Repeat this step until you are done cooking the tortillas. When the tortillas are finished evenly distribute and spread the chicken and bean mixture on each tortilla. Fold the tortillas in half and place on to a cookie sheet. You will most likely need two cookie sheets to fit all of them on. Bake for about 8 minutes or until the tacos are crispy and lightly browned. Let cool for a few minutes and top with lettuce, tomatoes, cabbage, cilantro, carrots. Whatever you fancy. 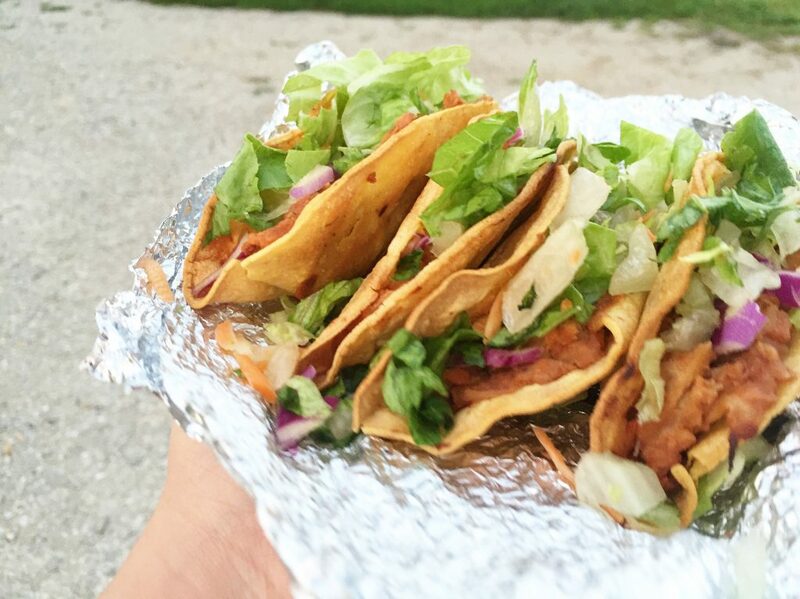 Serving Size: 1 Taco. 2 Smart Points. 2 Points Plus. 90 Calories, 1g fat, 11.5 carbs, 2g fiber, 2g sugar, 8g protein. I could eat this every night! I hate that I waited so long to try it….now I am going to look up Mexican Street Corn for an accompaniment for next time! Thank you for all you do! It is so helpful! I’m so happy you enjoyed these, Robin. The street corn goes perfectly next to’m and it takes just moments to make! 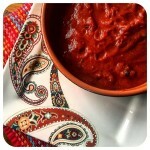 I want to make these tonight but I don’t have any salsa. Could I use rotel and not change the flavor too much? I love these tacos I just was a little curious why am I tortilla was so soft almost soggy. Any ideas why this happened? Hey Jennifer, is this when you’re reheating them or first time around? Try just baking them for a little longer until they feel crunchy to touch. I hope that helps! I’m probably a little late to this post to expect a comment back, but I just wanted some advice– I made these and they were AMAZING. When I went to reheat them after wrapping them in foil, most of them broke apart on the bottom of the shell… can’t figure out why! We ate them more as quesadillas the second time around. Anyways, I just found your blog and I’m obsessed. I’ve made tacos, enchiladas, bruschetta pasta, chicken chili and the breakfast sandwiches. So many of my friends have started following you due to all my delicious pictures! 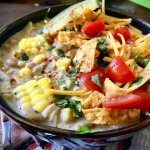 I made the Mexican-style street corn and I swear that I found heaven! Hi Ashley! I’m so happy to see you’re loving all those recipes up! I’m real sorry that happened with your tacos. I really am not too sure what could have caused that. I haven’t had that feed back and mine personanlly haven’t done that. The only thing I could think is that were they still hot when you wrapped them up? If so, next time.. Let’m cool before wrapping up. I can’t wait to make these! Do you think I could use small flour tortillas instead of corn? The corn ones I use usually crack and break…which wouldn’t work well for folding them. Hi Jill. 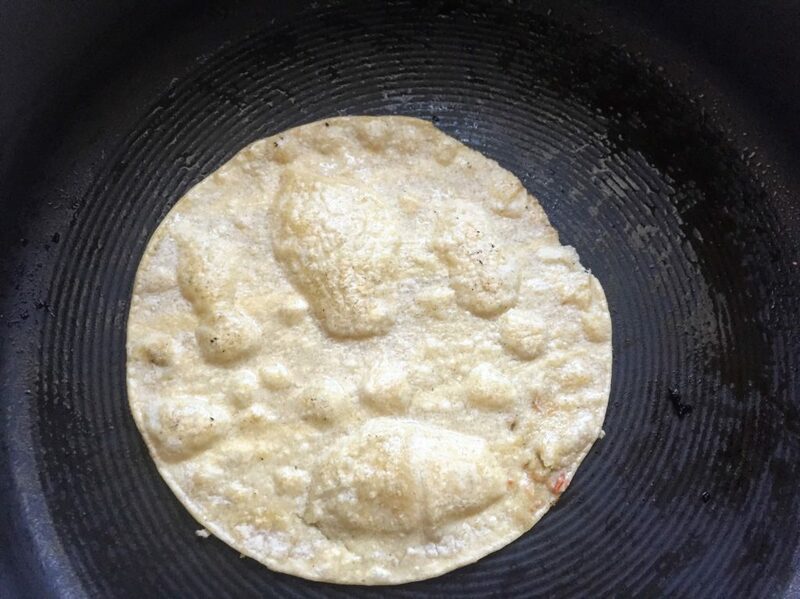 You most certainly can use flour, but the key to making the corn tortillas stay intact and not breaking is heating them in the pan first before folding. Do you think these would turn out the same (the baking part) with small flour tortillas? The corn tortillas I have found always crack. Can’t wait to try these next week! These sound amazing! 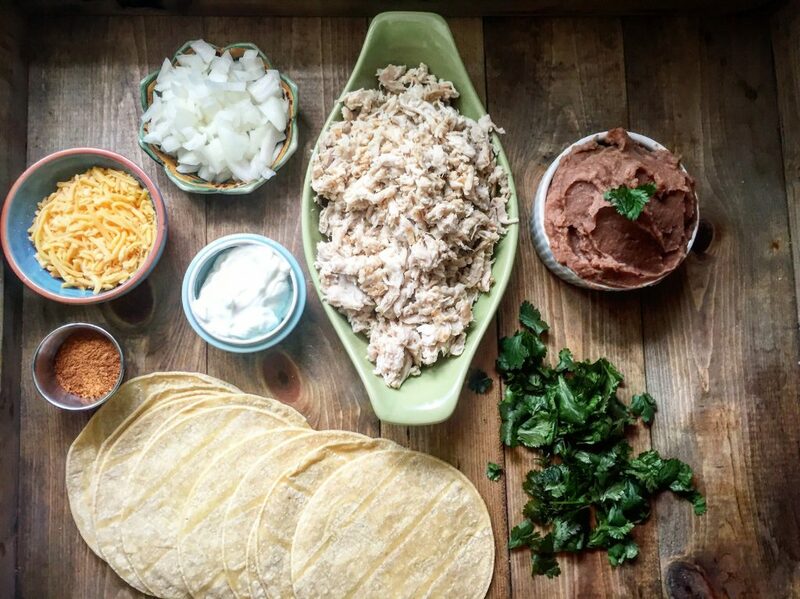 If I use your recipe for the Mexican shredded chicken, should i still add the taco seasoning to the chicken? I didn’t know if it would be too much or if that’s the way you meant it in the recipe. Thank you! I don’t think you should need to add the taco seasoning. 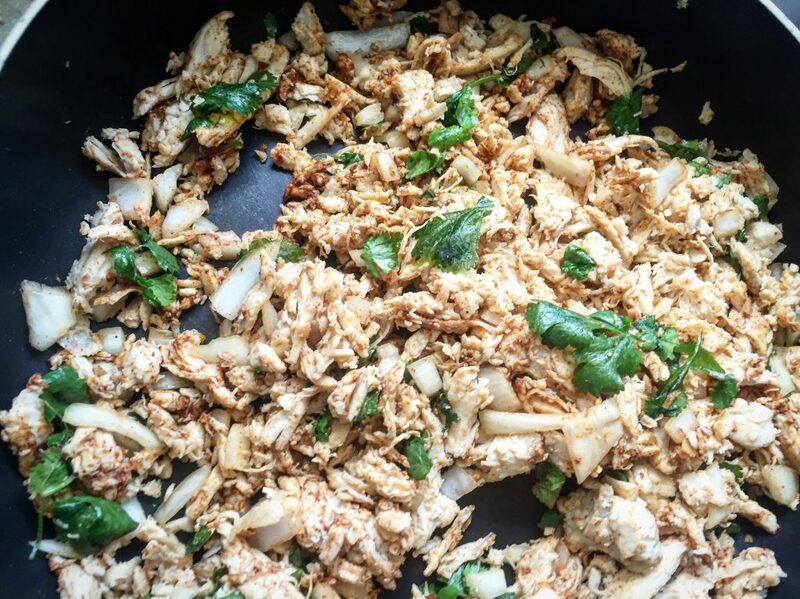 The Mexican Shredded chicken has plenty of flavor! I hope you love it! Could you mix up the filling a couple of days before? We are headed on a trip and these sound yummy. We could assemble and cook them there in the oven to save time, I’m thinking. There are 10 of us… Double the batch? I’d probably double the batch to be safe. While the tacos are pretty filling two tacos each might not be enough. Also, you can for sure make up the filling beforehand. I hope everyone enjoys! Oh my god, these are amazing! I got 19. We had 5 leftover, my husband and 13 year old son finished them after dessert and swimming!! They were a hit and I made the Mexican street corn to go with them. That is a winner too!! Thank you for making family friendly ww meals!! These are delicious! I doubled the recipe which will give me lunch for about 13 days! Going back to work after maternity leave and I’m trying to remain on plan with Weight Watchers. I messed up and only put in one can of beans but they are still delicious! I won’t forget the beans next time because hello! Zero points! Thank you for making and sharing such delicious recipes! What brand of salsa do you use? Thank you. I’ll take a look at it and fix it! Do you think I could make these a day in advance and then bake the next day? Do you think I could make these a day in advance and then bake? It should work just fine. I’m not the biggest fan of fat free ground turkey, but I think all the other flavor should make it delicious! I can’t believe I waited this long to make these tacos! 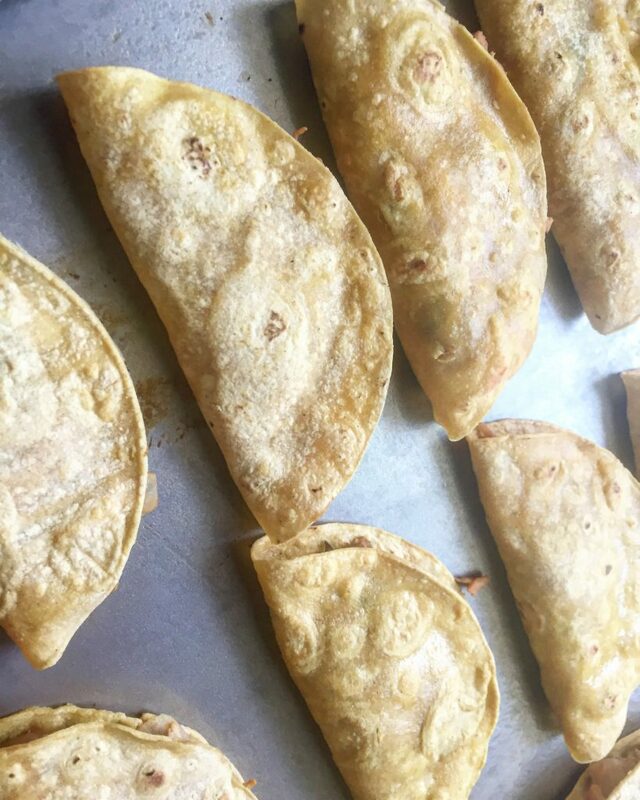 O M G – these are better than ANY taco I have ever eaten and the WW points are quite low! Thank you so much!!!!!!! Holy cow, I made these tonight and they were soooo good! 2 of my 3 kids even asked for them in their lunches tomorrow. That has never happened before! I feel like I’ve been stalking you blog lately but I can’t help myself. Every recipe I have tried has been a hit. Thank you so much! Yay, you’re welcome. I am so so so happy to hear the family loved the tacos, Kathy! “Stalk” away. Haha! There here for a reason! I was DETERMINED to make these tonight even though I didn’t have any chicken or turkey and didnt have any lettuce, tomatoes, taco toppings, etc. In the house! I made some shrimp on the side instead of putting them in the tacos because I was afraid to overcook the shrimp. I made the filling with red onion and I added some frozen mixed colored peppers to the filling mix, otherwise everything was the same. They basically ended up being cheesy refried been quesadillas. They were phenomenal!!! I can’t wait to really have all the fixings to make these the right way!!! Thank you so much for this recipe!!! 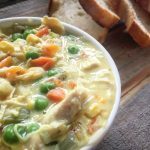 I’m so glad you were able to make this recipe yours with what you had on hand and that you loved it, Randi! Love to hear that, Thank you! I am going to do these with your mexican shredded chicken. I will eliminate the taco seasoning but should I eliminate anything else, onion yogurt? You can eliminate the taco seasoning and onion, but you can keep the yogurt, cilantro, refried beans, cheese. Hope you love’m! Hello! Yum! I’ve bedn seeing these everywhere on IG so I need to make them! Is the chicken weighed raw or cooked (1 lb)? Thanks! Hey! When you freeze them or store them in the fridge. Do you bake them first and then wrap in foil? Yep Bake’m first, let’m cool, and then wrap in foil and store in freezer. Hope that helps! I made a vegan version of these tonight and they were delicious! Used spinach instead of chicken, coconut unsweetened yogurt and so delicious non-dairy cheese. Thank you so much! I am so glad you were able to make them vegan! Thanks for sharing. I’ll be able to let others know it can be done! Tried these tonight and the whole family loved them! 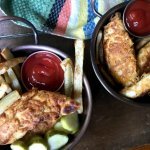 I made these for dinner tonight! They were sooooo good! My husband loved them… a lot! Thanks for all the awesome recipes! We have also cooked the southwest egg rolls and meatball sub bubble up. All so good! I made them the other day pretty much exactly as posted (cut the recipe back b/c there are only 2 of us). At 3 tacos for 5 points… what a flavor and point bargain!! I made enough so that we’ll have them tonight again. I had to come back here to get the reheating instructions. How easy is that? Thanks so much for that recipe. PS: made my own “refried beans” by dumping a can of pinto beans UNDRAINED into a skillet and mashing them w/ a potato masher until creamy but still a little lumpy. Simmered until some of the liquid cooked off and they were the right consistency. I’ll never buy canned “refried” beans again b/c these were so moist and creamy. And just as easy. I’ve been looking high and low for your Stove Top Fried Apples and Shepherds Pie. Did you ever post the recipes? I have not! I’ll post them both soon! OMG-these were the bomb! Loved them! I skipped the retried beans cause we aren’t bean people and increased the reduced fat cheese to 1 cup. It kept the points the same. Absolutely loved them and so happy for leftovers! Your shredded chicken was also perfect! Thank you, thank you, thank you! the chicken will need to be already cooked and shredded. Oh, sorry, one question. When you wrap in foil do you wait until they cool or wrap hot? Want to keep as much crispiness as I can. Thanks! I wait till they are cool! Just finished making my first batch, so good! Grown kids and grandkids are eating them up now, not even waiting for additional toppings! So much for meal prep! I used a mild taco seasoning and sauce, next time I’ll use something hotter. Awesome recipe! Thank you! I’m so happy you enjoyed! 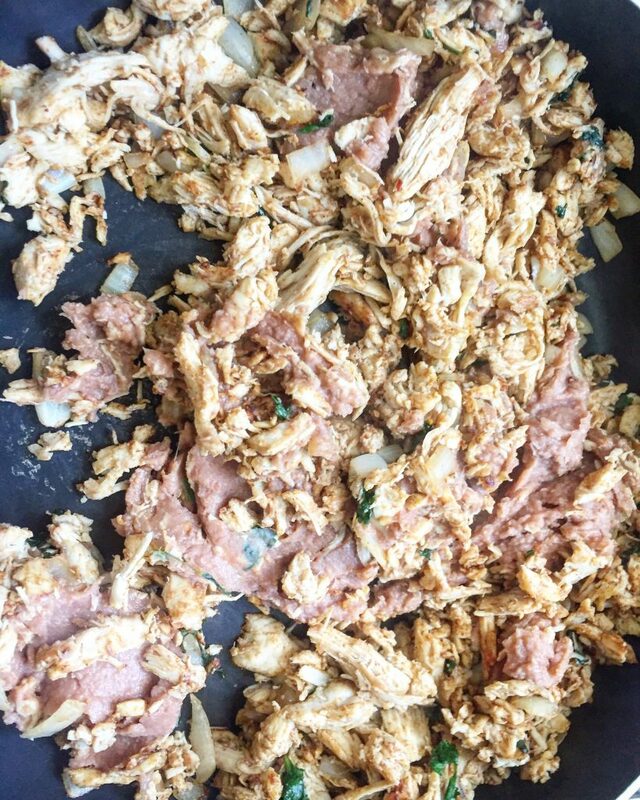 I’m planning on making your Mexican Shredded Chicken recipe and was wondering if you think I could use that + refried beans for my filling. Yes, for sure!! I hope you love these! Can I use fat free sour cream instead of yogurt? These were awesome! I didn’t use any cilantro, as my family doesn’t like it. Other than that I followed the recipe exactly. The whole family liked them! Thanks for sharing! We will definitely make them again. Thanks for what looks like a great recipe. I plan to shop for the ingredients tomorrow so I can make them. Do you have a calculation for the points per taco on the new Freestyle version of WW? I noticed the points for sp and pp but not Freestyle. 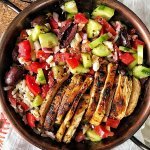 Thanks for sharing all your great recipes. 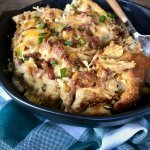 I have tried so many of your recipes and I have loved them all!! I can’t wait to make these this upcoming week! 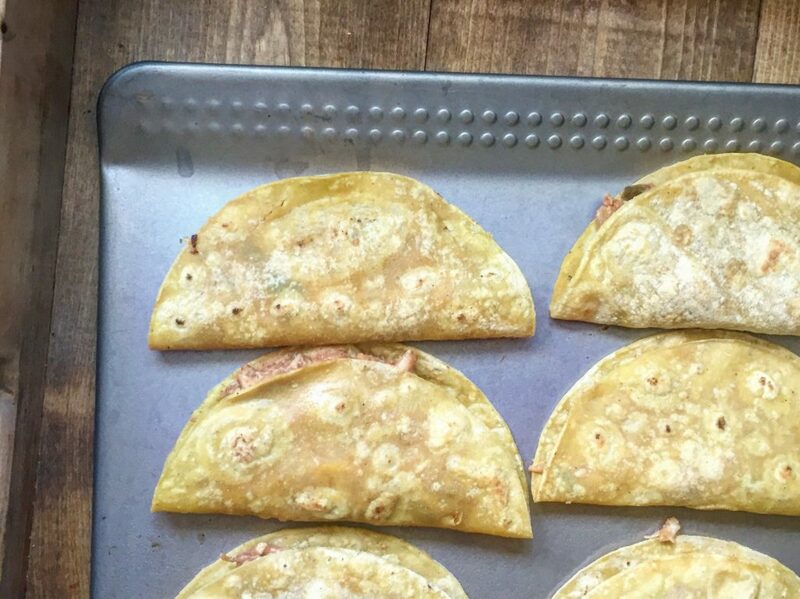 If I used flour tortillas (I have a whole package and I’m trying to clear about my cabinets!) would that increase the points drastically? 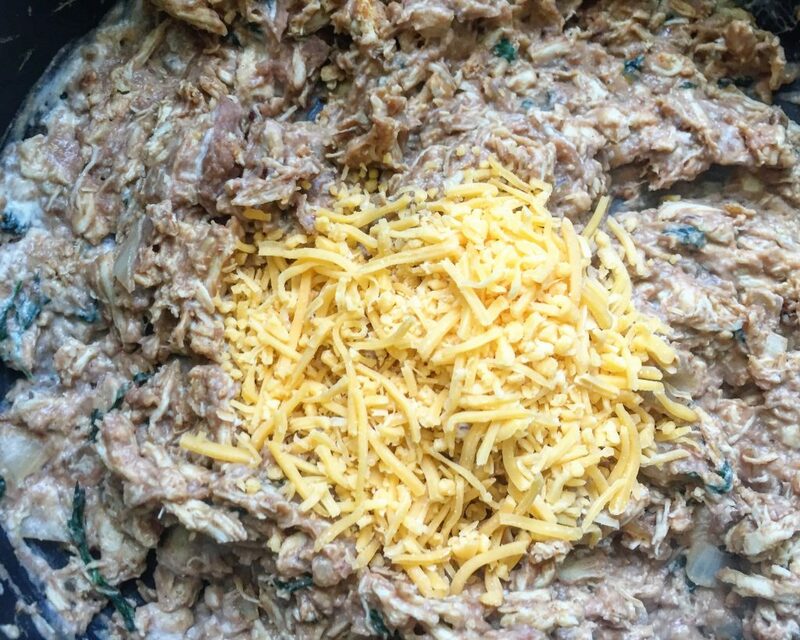 how do i measure out a 1lb of shredded chicken if i do not have a scale? i know this seems stupid. But how many cups would a pound of shredded chicken be? If I had to take a good guess, I think it’s about 4 cups. I’m honestly not sure though and I don’t have any shredded chicken in the fridge right now to measure out and weigh. Thanks for bringin that to my attention though. I will be sure to do that next time I have it and add it to the ingredient list in cups!! Another good meal!! I really liked your street tacos. Thanks for sharing. Oh my goodness… so good. Help… how do I calculate. This is one of my favorite recipes! Have you reheated them in the air fryer before? I haven’t yet, but I’ve seen LOTS of people do it and they loved it! I made these for the first time, using scrambled eggs for breakfast tacos!!! I just slightly undercooked the scrambled eggs before putting them in the tortillas. Delicious! Making these this weekend gonna do a double batch and freeze them when you reheat do you unwrap them or leave in the foil? I open up the foil, but I don’t unwrap completely. They will get crispy again that way. I hope you enjoy! Not a big fan of refried beans. Do you think I’d need to add a little more yogurt just for moisture or do you think i’ll be ok eliminating the beans all together? Love your recipes, I did a batch of the breakfast sandwiches for work this week and they’re phenomenal. I’m so happy you enjoy the sandwiches. I haven’t made them without the refried beans, but I think it should be okay without adding the extra yogurt. I hope you enjoy! Can you take out the Greek yogurt? I’m not a fan of the texture and taste of it. Or can you not taste it? Hi again. I’m sorry to be a pain. I just re-read the recipe and comments for re-heating and I see three different oven temps. 350. 400. And 425. Any direction you can provide? Thank you! Question. You list two different oven temps. 400 and 425. Which do you recommend? Hi there, sorry bout that. It’s 425 the 400 is for reheating them and I never caught that in the post before. Hope you enjoy! Hi! Have you used sour cream instead of Greek yogurt before? Yep go ahead and use sour cream! OMG! These have to be the hands down best tacos you’ve came up with and my Mom has ever made! They’re just so darn good! I pretty sure I ate half of all of them! THank you so much for making not only food that’s good for you, but food that’s good for the soul! Too bad you can’t add more than 5 stars, LOL! Will these work with ground beef or turkey instead of the chicken? These tacos are absolutely delicious!!! I do have a question. Instead of making all the tacos at one time, there are only two of us, I just refrigerated the meat mixture, and made only a few at a time. I’d like to know how much meat mixture you put in each taco? I may have overstuffed mine!! Made these tonight and they were delicious! Thank you so much for sharing. They were delicious! Just made these tonight and the family and I loved them! Thank you for sharing this recipe. Definitely will be making these again! When I plugged in that I ate two on my fitness pal it says the calories are 318? I’ll double check and get back to you, but I’m fairly sure the info is correct. Did you plug in the mission extra thin corn tortillas? These are amazing! I just want to thank you for this and all of your recipes! All phenomenal! I have to add that I am a. Vegetarian/pescatarian so I don’t eat meat and every recipe I’ve made, including this one, I have vegetarian-ized. This one I followed exactly except I used tofurkey faux chicken strips in the place of chicken. My husband ate 4 the night I made them. He is a carnivore and loved them! These will definitely be in my regular rotation now! So budget friendly too with making so many, freezer friendly, and great for work lunch!!!! Thanks!!!! These are my new favorite! For anyone with an instant pot I was able to do my chicken 20 minutes on the poultry setting then NR. Then set aside and sautéed the onions and so on with the recipe. One pot to mess with, heck yes. Oh I am so happy you enjoyed these tacos! And, I really appreciate the tip for the Instant Pot! I have yet to grab one of those things. I’m just being stubborn really. Haha! Made these tacos tonight and they were a hit!! Even my 3 year old loved it! Yet another winning recipe from DDOP to add to my rotation. Question- for the chicken is it 1lb before or after it is cooked? These look so tasty! Have you made them with ground beef instead of chicken? Just wondering if that would still work. Hi Star! The filling is so delicious but my tacos didn’t come out crispy. Any thoughts on what I did wrong? I used the extra thin and heated them first. But not very crispy out of the oven and yours look soooo crunchy! Oh my goodness, delicious. I will be freezing some, just so I don’t eat them all right now. I follow you on Facebook also, you never disappoint. Thank you! Awe, thank you so much!! I hope I never disappoint in the future either! I am so happy you enjoyed! These tacos are so good! Thanks for the tip of the extra thin tortillas!!!! So happy I found them! My whole family loved this meal. I’m so happy to hear the family enjoyed! I started using them for tacos when they first came out and they are such a good deal! When I put this into the recipe builder, it says 3 smart points per taco. Any idea why the difference? It could be the corn tortillas that you used. 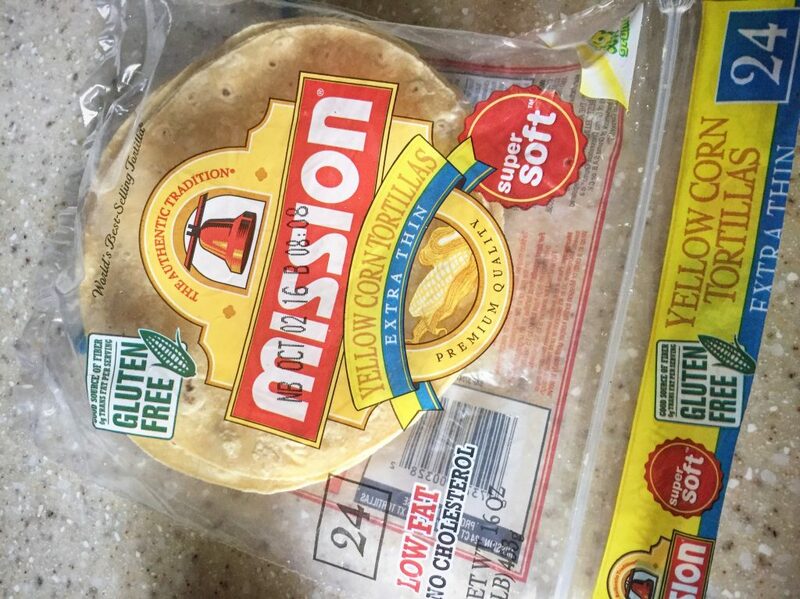 I use the mission extra thin tortillas which makes them a lot lower in points. 3 Smart Points is still a pretty good deal per taco though. Hope you enjoyed! These were loved by everyone!! From my 8 year old niece, to my husband (who usually hates refried beans, but I snuck ’em in anyway!! ), even my college aged brother loved them. And of course my ww self was excited to be able to eat 3 of these, guilt free. 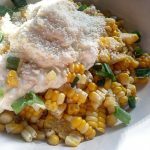 Paired with the Mexican corn on your blog. Perfecto. May add some jalapeños to the chicken/bean mixture next time to crank up the heat Had them for dinner last night and already looking forward to having them again for lunch. THANK YOU! These were delicious!!! Made them for my lunch for the week. Can’t wait to have lunch again tomorrow! so happy you love them!! Your page was recommended on Ww connect, and I’m so excited to have found you! 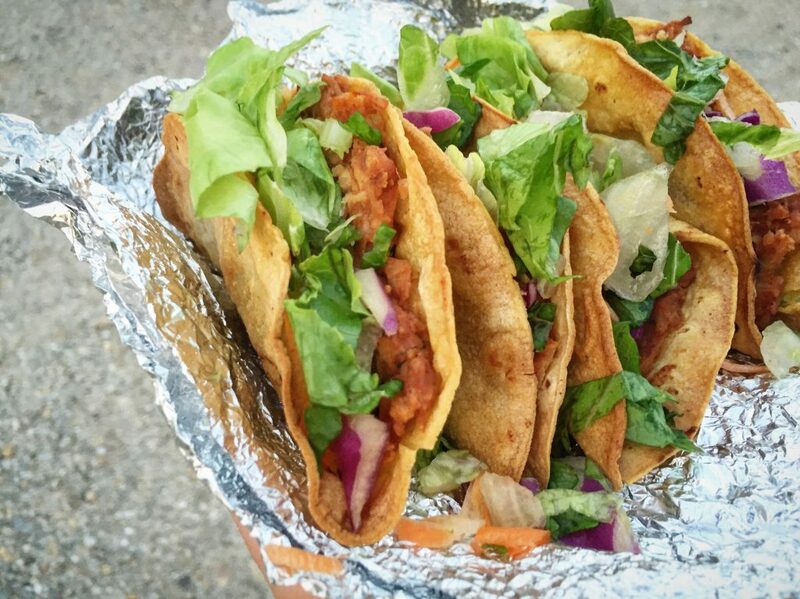 These street tacos are delicious! So excited to freeze the extras for lunches! Next recipe to try is your Cuban sandwich! So happy you found me here and that you enjoyed the street tacos! I just love the cuban sandwiches too! Let me know what you think, if you get a chance! These are delicious, mine came out to 3sp per taco… not to sure why! But great recipe!! Thank you, happy you enjoyed! It could be the tortillas or other ingredients. Sometimes different ingredients can add up a bit more. Have you tried freezing them? Cannot wait to make. I am new to your website and have tried several things with great success. I have two picky teenagers and the biscuit gravy casserole and Moms chicken casserole was a huge hit? Hi! Yes, you can freeze these. I wrap 2 tacos at a time in foil and then throw them into a freezer friendly ziplock bag. I personally take them out and thaw before reheating them. I reheat at 350 for about 15 minutes until warmed through. I’m so happy you’re family is enjoying the recipes! These have been on my list for a while, and I finally made them today. They were amazing. I can’t wait to have leftovers through the week. I can’t figure out how yours were only two points, mine came out to three (even with testing out different brands in the recipe builder), but they are well worth it! Thank you, So happy you enjoyed them! A lot of the times when people have had a problem with getting them at 2 Points is when they did not get the extra thin corn tortillas. Mission makes them! Not sure if that was the problem, but glad you enjoyed! Can you also use with plain chobani greek yogurt? it might change the calories but will it change the consistency? Greek yogurt would be a perfect substitute! Made these last night and my family loved them! My first recipe from you. I’ll be sure to try some more of them! So happy you liked them! I hope you enjoy whatever else you decide to try. Be sure to let me know! These couldn’t be more delish and a family favorite also..
You are a genius!!! On the WW train as of two weeks ago and I made these last night for my family. We are a taco loving group and my husband HATES corn tortillas so I was expecting some push back. However he kept an open mind and halfway through dinner said “these are really good and so filling.” My kids loved them. And I ate 4 – because I could at only 3pts (I didn’t have RF cheese and used thicker tacos..but still even 3pts each is amazing)!!! Thank you. Love everything I see on this blog. Can’t wait to try another DDOP recipe. Thank you so much. I have to admit I don’t love corn tortillas either, but I was determined to make them delicious somehow and that’s how I came up with these! So happy you and the family enjoyed! I’m confused why the calories say 90. The tortilla alone says 120 calories online. How are the calories calculated? After seeing these on your blog/IG for months, I FINALLY have them on the menu (and ingredients on hand) for this week!! So excited! We’re making these tonight! Is it 3/4 CUPS of cheese? It just says 3/4. Want to get it right! 3/4 cup of cheese. I hope you enjoy! Made last night! I must have underfilled because it made 24 tacos! They were so yummy! So excited to have these to reheat throughout the week. These look great! Any idea how the point total would change with low fat sour cream instead of reduced fat and regular re-fried beans rather than fat free? Having trouble finding these in my local store. Hi Star, is the pound of chicken pre or post cooking weight? Thanks! It’s cooked! I hope you enjoy! Hi Parker! When testing this recipe I did have problems with that. That is when I decided to add the step where I lightly “pam fry” in the pan before folding them into a taco and baking. I didn’t have a problem whatsoever when I added that step! I hope that helps and I hope you enjoy! Thanks! I can’t wait to try these! Made these tonight and the whole family loved them! I used exactly 1/4 cup per tortilla and it filled 19. I had less than 1 lb. of chicken so I am sure I would have filled 20 if I had a full pound! I’m so happy you and the family enjoyed the tacos! And I’m sure ya woulda filled them up with the pound of chicken too. These are wonderful!!! I made them last week and again tonight and hubby managed to eat 11 tonight!! Thank you for sharing! Definitely a hit at our house!! You’re so welcome. I am happy to hear they are a hit with the family! I love them so much too! Finally something my whole family will eat…and it’s point friendly for me! I LOVE your recipes and have tried several. None disappoint! You are so talented! Thank you so much! That’s so kind of you to say. I love cooking so much, so it’s my absolute pleasure to share recipes! We loved these! My family devoured them, and I liked that I could make such a big bunch at once and we could eat on them for a couple of days! Yes! and you can have so many tacos on taco night!! (That’s my personal favorite part, haha!) Thanks Leah!! haha! Nothing goes better with taco that a nice cold one. I think the first time I made them there were very FEW leftover. I couldn’t stop eating them. Good thing they were super low in calories!! This goes in my top 8 for sure! I want them right now! Mmmm! Me too! You and Lauren come here and We will have a big ol taco party! These looks amazing! Do you think they would freeze well? My boyfriend doesn’t like Mexican food (the horror) so it would just be me eating them. These are so good! Thank you! Made these tonite and they were fabulous! My entire family loved them! And that is saying alot! Missed that part about the taco seasoning too but really was great! We had so many so I am going to test freeze a couple and see how they do. My husband says I am the queen of reheating anyway! LOL. Also just FYI, they were so filling we could only eat 2 at one sitting. YUM, did I say that? 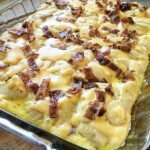 Love your blog and recipes! If I take them to work and only have a microwave will the get soggy? Hi Tammy! They will lose most of the crunch, but they don’t taste soggy. I think they still taste great. I personally like to eat them cold also! Can’t wait to get home and make these, they look delish! You are so welcome! I hope you enjoyed! These were delicious! I forgot the taco seasoning but they were delicious regardless. Thanks! Angie, Thank You! YES!! I love them. I hope you enjoy, so much! Sooooo good! My husband ate ten of them for dinner. haha oh my gosh! Awesome! he’s my hero. Made them and they were fantastic!!! A new family favorite!!! These look delucious! I am getting ready to do a cook-ahead and am going to share with my daughter’s family. She also has a precious toddler and is a WW member. Thank you for taking the time to post your recipes. 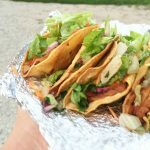 I used the directions at the bottom and it never mentioned the taco seasoning so I forgot but even without it these were amazing and my husband loved them! I’ll likely make them again this weekend! We’re making these tonight and we are soooo excited! I’m going to make these tonight! Love your recipes! Summer, I hope you enjoyed them! How do you store these to eat throughout the week? Do you freeze or refrigerate them? Can’t wait to try these! About how much filling would you say you put in each tortilla? A few tablespoons? I should add that to the post! I’d say about 1/4 cup maybe a little less!